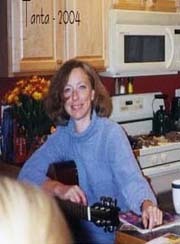 Calculated Risk: Housing: Inverted Reasoning? Housing will experience a soft landing, because the economy and job growth are strong. That appears to be the logic of certain pundits, and California's Inland Empire is an example of this New Millennium economy. There's just too strong an economy and too much job growth for much other than the "soft landing" Husing and other economists have been predicting for the end of the five-year housing boom. "We are right on the cusp of a very powerful period in job growth," Husing said. "Local [Inland Empire, San Bernardino/Riverside area] unemployment in May was 4.2 percent, and that's the lowest I have seen for May in 42 years of studying the local economy. ... inhabitants of the Inland Empire should hunker down for an unprecedented retail boom. ... that was the consensus at a panel ... at the first annual RealShare Inland Empire Conference, held [August 9, 2006]. That is the optimistic view and many pundits have made the same argument for the entire U.S. economy too. 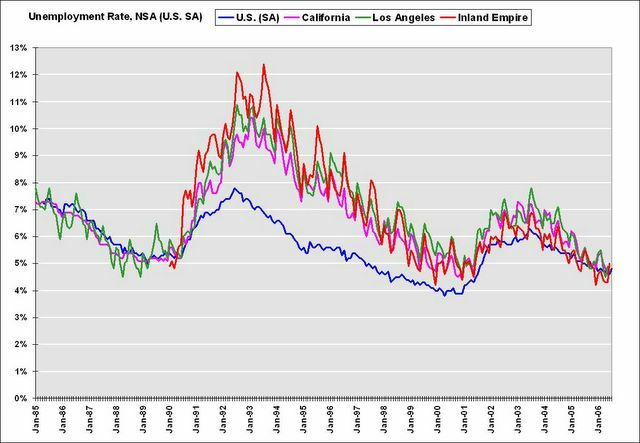 On the other hand, is it possible that the Inland Empire economic boom has been driven by housing, and that the housing bust will start a downward vicious cycle? First, here is some housing data released today by DataQuick: Southland home sales slowest in nine years; price gains lower. Southland home sales downshifted last month to the slowest pace in nine years as the rate of appreciation fell to the lowest level since fall 1999, a real estate information service reported. Last month's sales total marked the lowest for a July since 1997, when 22,302 homes sold, and fell below the July average of 24,669 going back to 1988. Perhaps the Inland Empire immune to the housing slowdown. The following graphs are based on the DataQuick data. 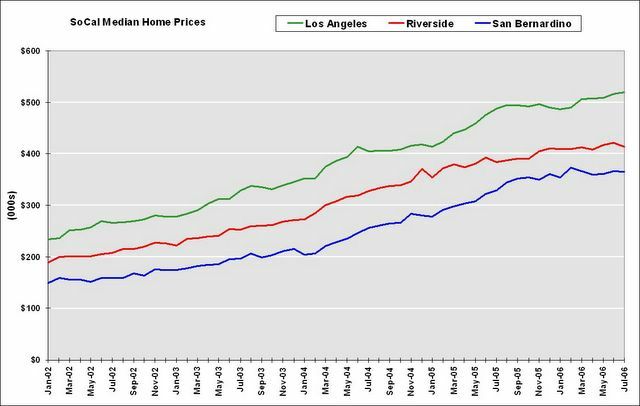 This is a comparison between Los Angeles and the Inland Empire (Riverside and San Bernardino) for the number of housing transactions and median house price. 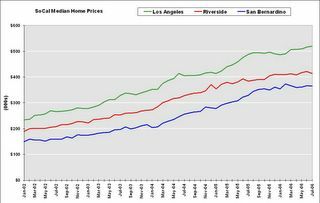 The first graph shows the monthly median home prices for Los Angeles, San Bernardino and Riverside since 2002. 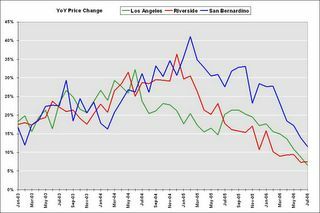 Prices in the Inland Empire increased about the same as Los Angeles, and recently appear to have flattened out. 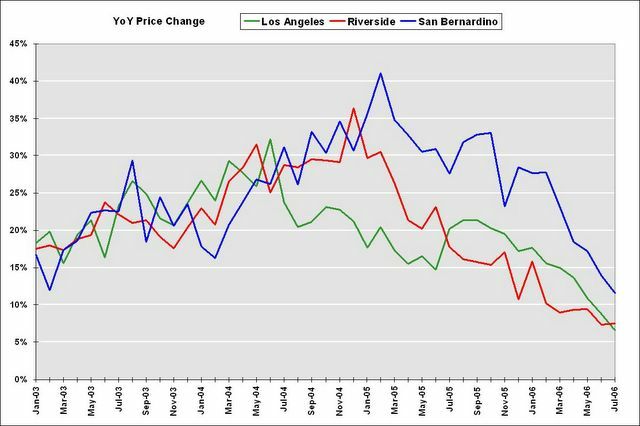 Prices in both Riverside and San Bernardino are about 2% below their recent peaks. The second graph shows the year-on-year change in the median price for the three markets. YoY price appreciation is falling for all three markets. 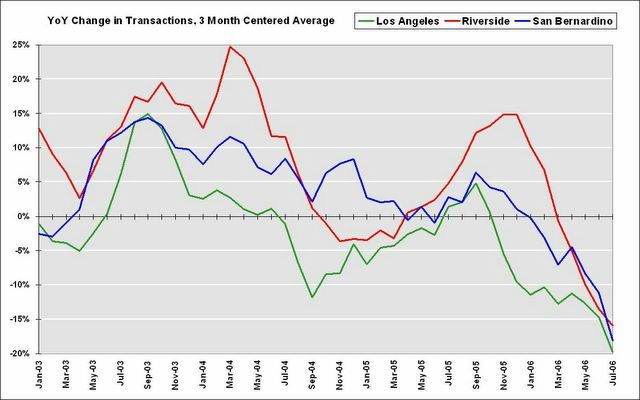 The third graph shows the YoY change in the number of transactions for each market. 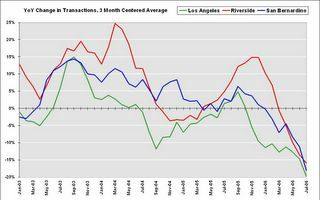 There doesn't appear to be anything special about the Inland Empire when comparing the housing market to Los Angeles. 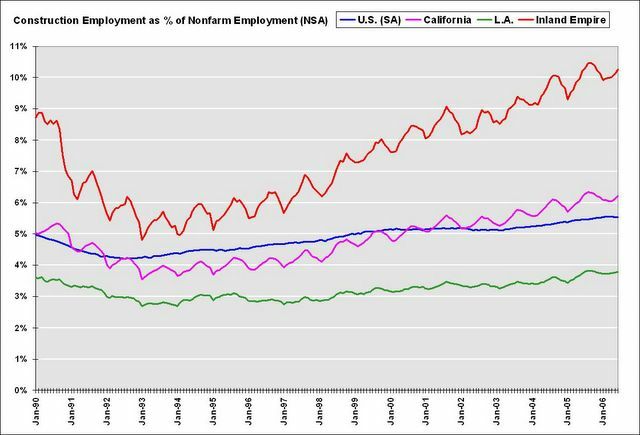 This graph compares construction employment, as a percent of total nonfarm employment, for the U.S., California, Los Angeles and the Inland Empire. Note: Construction includes non-residential construction. Here is the hierarchy: Los Angeles has benefited less, in terms of employment, than most of California and the U.S. from the housing boom, California has benefited from the housing boom more than most of the U.S., and the Inland Empire is perhaps the greatest beneficiary. So what happens during a housing bust? Just look at the unemployment rate in the previous bust. The unemployment rate in California rose from 5.2% to 10.4% in just over two years. 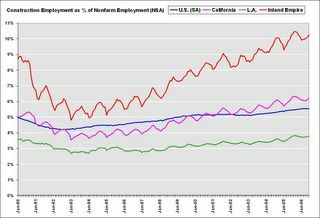 For the Inland Empire, the unemployment rate rose from 4.8% to double digits in the same period, peaking at 12.4%. Yes, California was impacted by Defense cutbacks in the early '90s, but the areas that were most dependent on housing saw the largest increases in the unemployment rate.